One of the most important parts of the trip planning process is to find accommodation and secure it well in advance, in such a way that we do not need to worry about where we are going to stay upon arriving in a new destination. Furthermore, depending on the specific characteristics of our visit or adventure, we may look for low-cost lodging, spaces that allow us to do more than just sleep (work, meet up with other people, practice sports and enjoy beauty and spa treatments, to mention a few examples), luxury resorts, nap cabins to spend time on our own, spacious apartments for the whole family, or rooms close to a certain landmark or venue. Even when finding the perfect accommodation is relatively easy thanks to the diverse range of different options available, doubts arise at the time of booking a hotel online since many fear that their private info will be stolen or that the booking they are about to make might actually be a scam. Our recommendation in such case is to do it through a reliable website like Booking.com, backed by years of experience and trusted by travellers from all over the world. You don’t need to register to make your reservation. If you are feeling lazy, in a hurry or just do not want to enter additional information about yourself other than the strictly required to book accommodation online, there is no need for you to sign up for an account to complete the process. A confirmation with the reference number of your booking will be sent to the e-mail address you provide, thus enabling you to manage it at all times. In most cases, you won’t pay until you arrive. 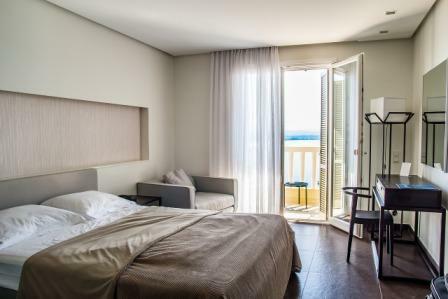 Although a credit or debit card number is requested in that last stages of the reservation process, the majority of establishments you can book your stay with through Booking.com won’t charge anything until you arrive. Only in the event of finding a room with a significant discount –sometimes up to 70% off the actual rate- will you be asked to pay at the time of booking. Also, some establishments may block a small percentage of the amount to be paid before you get there as preauthorisation. The process of booking a hotel online is simple and quick, and you will get a confirmation in a matter of minutes. Once you have selected the location and dates for your trip, choose an accommodation, the category of your room and the number of guests to be accommodated. In order to secure it, all that is left to do is submitting the personal info that will help the staff identify you upon arrival or contact you in the meantime. You will receive a detailed confirmation of your reservation immediately. You will be able to modify or cancel at no cost in almost every case. Generally, when you book a hotel online through this website, you can make any modification or cancellation you want without incurring penalty fees until 24 or 48 hours prior to checking in. Notwithstanding that, note that, providing you do not show up or cancel after that period, the fare corresponding to one night will be charged. Booking.com puts you in touch with the booked establishment so that you can customise your stay if needed. By providing info like e-mail address, telephone and contact forms, you will be able to make any changes to your hotel reservation, ask questions to the staff, request airport pick-up service, tell them at what time you will arrive and inform about any special needs you may have. Do you travel frequently for business or leisure? If you are a regular guest in hotels because you fly to work abroad, we recommend you consider staying in airport hotels on your trips.